Our long cherished journey to Dolpo kick started as the Yeti Air plane bound for Juphal landed on the airstrip of Juphal. As we got off the aircraft, we felt as if we were at some faraway settlement. 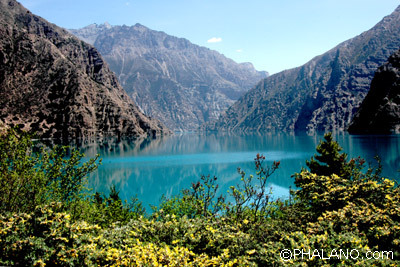 On the trail, we came across many places – Dunai, Bhedigoth, Kagsi, Raktang, Sangta and Chhepkaka – before reaching Lake Phoksundo. 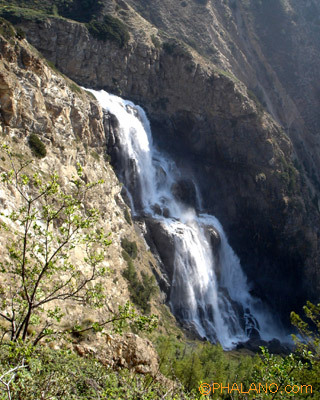 The trek that had taken uphill from the confluence of Sulighat and Bheri River an hour away from Dunai continued till the Tapiricha School of Saijal, situated at the foothill of the lake. Now our destination was just an uphill walk of four hours. 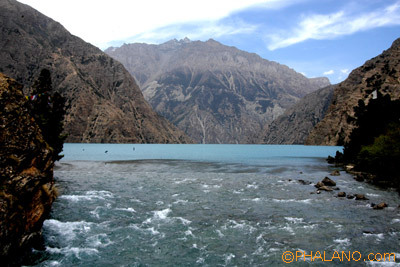 We headed towards the lake, coercing our feet against the steep mountains. The uphill trails adorned the serpentine queues of the worm collectors. 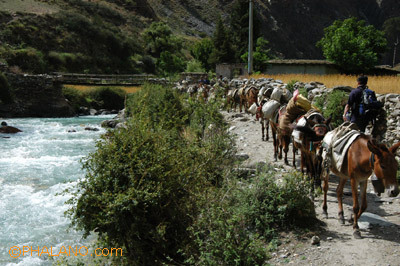 The people hailed as far as from Jumla, Rolpa, Rukum and Jajarkot, and had their ration transported on the backs of donkeys and jhopas. 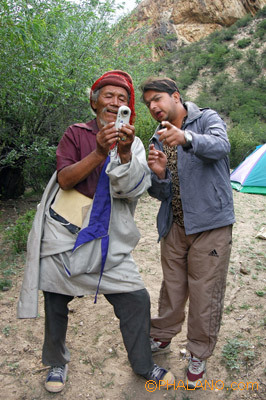 We were accompanied by Thinley, the chief protagonist in Caravan, from Dunai. He was on his way to his village Saldang. He, along with daughter Dawa, was returning from Kathmandu with a stock of medicines for the health post at Saldang. œIt’ll take three more days to reach home, he said, standing on the bank of the lake. 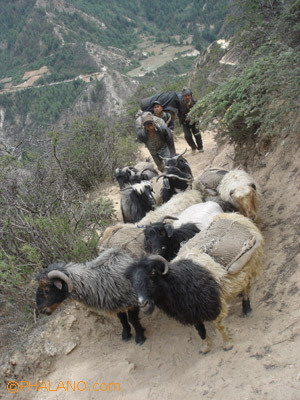 We felt his popularity everywhere in Dolpo. The CDs of Caravan were available at the shops in Dunai. œI’m amazed when people approach me, saying they want to cast me in their products, he told us, laughing. 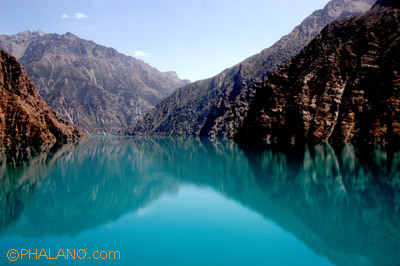 œThough (the film) Caravan has given Dolpo an international exposure, the hardship of the people is never any less, correspondent Budha explained, œThe dispute over the depth of this lake hasn’t yet been subsided. The Department of Meteorology, in its survey three years back, had suggested the depth to be as 145 meters. However, other data contradict it to be as deep as650 meters. 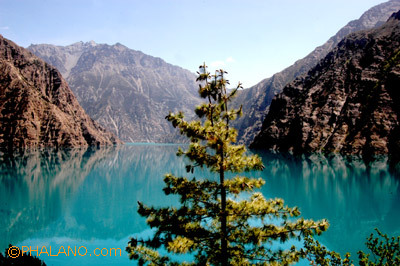 The data of the Shey-Phoksundo Conservation Office too suggest that foreign tourists visiting the lake numbered just 36 till November this year. 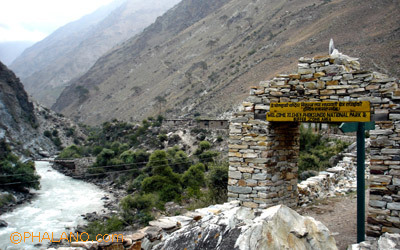 Tourists visiting this destination had reached 254 two years back. 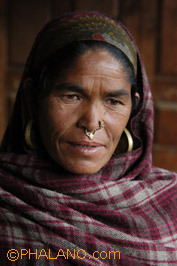 The arrival took downturn since the Maoists imposed US$100 per person as entry tariff to the area. 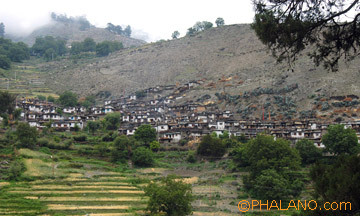 Its very nice I lost in the beauty of Phoksundo… I really enjoy Thanks for this. All the neplease knows that our country is beautiful. but the many country and the people don\’t know. 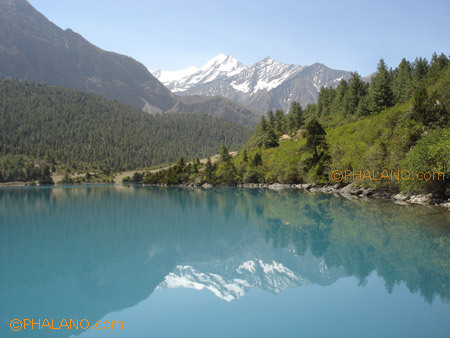 even neplease don\’t know the beautiful place of nepal like manang,mustang, dolpa e.t.c reason there is no veicheles no facilites which the people want. 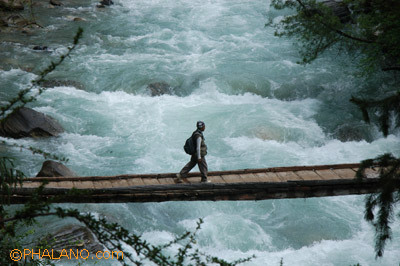 but today through phalano.com many peoples are knowing the beauty of nepal and places. 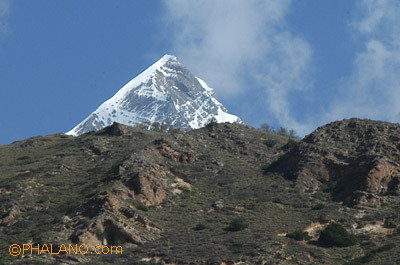 Really, Nepal is a very beautifull country. It’s sublime scenary always attracts me. I go ussually to Nepal for mental peace. It’s a place where the God resides. do not need to say anything, pictures speak its’ own wow… such great an beautiful snaps ..and great job.. hardly, we can have a chance to see a beautiful view of nepal even we re ne[alese… u only did a great job for all of us..i really appreciate ure brave and keep it on.. one day i will be there where u have showed us a natural beauties of nepal. thanks once again dai and phalano,com for ure contribution. Hi.rjesh k.c. 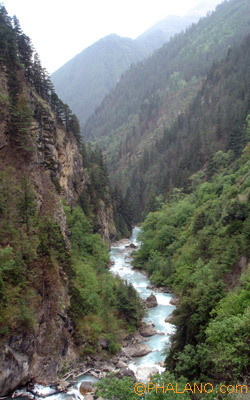 daju, Really, Nepal is a very beautifull country. It’s sublime scenary always attracts me. I go ussually to Nepal for mental peace. It’s a place where the God resides. hi rajesh ji thanks alot for such wonderful pictures and if possible please keep some more recent photoes too .I hope you will do it for the persons who are far frm their country.Looking such pictures we feel proud of being nepali. hoping to have a look of more recent photoes again thank you very much. Its amazingly the greatest scenes which i never seen before. 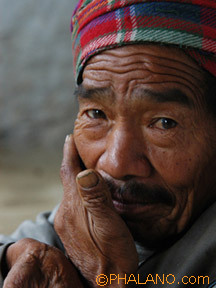 highlights the treasures of Nepal ama, all over the worlds. SIMPLY GREAT , SIMPLY GREAT, I M REALLY IMPRESSED BY THE SCENERIO. I M A PETRIOTIC CITEZEN , I STAY AT MUMBAI SINCE LAST 25 YEARS AND NOW I M PLANNING TO GET BACK TO MOTHERLAND. JUST KEEP IT UP , AND GO NO……. 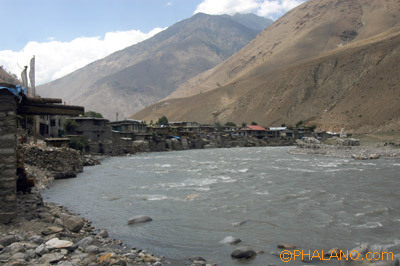 Dolpa is our heaven so must protect this place and all of nepali will must go there and feel there system that this place is nepal or not. 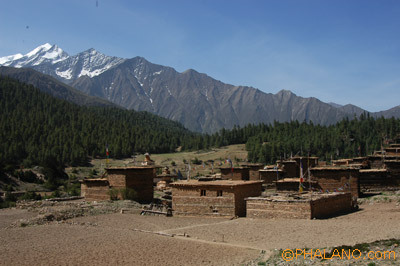 A t last i am proud him who tell us about dolpa. 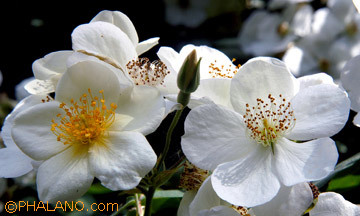 hamro desh nai sorga chha ni tara ke garne tyo sabai camera photo matra simita bhayo hami jasta yuva sakti bidesh ma rahanu pareko chha ?aba ta desha lai samjhida pani …………………………? All the photoes are so cute.its the heaven of the world.thanks for photograffar.